The white shall, tied neatly, tightly, under a stern chin: the sight is a familiar one in the Plaza de Mayo in the heart of Buenos Aires. The popular square, which was the scene of the 1810 revolution, has been political gathering place for protests as early as the mid-forties. Arguably, the most renowned group to establish their presence over the years has been the handkerchief-donning Madres. During the Dirty War of Argentina lasting from 1976-1983 an estimated 30,000 people were “disappeared”: kidnapped, tortured, raped, brutally murdered then buried in mass graves, thrown in the river, or disposed of through other methods. Although some of these “disappeared” members of society were leftist guerilla fighters or organizers meetings to overthrow the military dictatorships in power, the majority of them were university students, academics, or other liberals who at one time might have vocalized a critique of the government. Some of the “disappeared” were not even dissenters but rather unfortunates who happened to show up in an address book of interest to the government. The mothers of the “disappeared” would knock on doors to obtain information regarding the whereabouts of their children; they visited the Ministry of the Interior, police departments, churches, barracks and tried to make contact with Military chiefs and members, to no avail. In order to get leverage and put more pressure on officials to respond, they decided to meet in the Plaza de Mayo across the street from the Casa Rosada, or the Pink House. As word of their demonstrations quickly spread, their numbers grew from 14 founding members to hundreds (newspapers were censored from addressing any “disappearances”). The association split into two groups in the mid-eighties, after the fall of the juntas and the democratic election of a new President. One faction focuses on legislation in persecuting past officials and gathering remains of the deceased. Laws to block the prosecution of such officials were originally drafted in 1986 and 1987 by Raúl Alfonsín’s government in an effort to quell a military rebellion incited by officers that were angered at human rights trials, says Human Rights Watch. The efforts of the Madres have helped convict former police officials and higher-ranking officials since the annulment of those amnesty laws which had guaranteed impunity for 20 years. The other group is more politicized, proclaiming to adopt and continue the leftist ideology of their children and at the same time refusing government aid or compensation until formal government recognition of the systematically forced disappearances. This latter group has become more radicalized, evidenced by the defense of the actions of the Sept. 11 hijackers, whom they call courageous, and the inclusion of Saddam Hussein’s writings in their recently published book. The backing of younger militants inspired by the Cuban Revolution can partially explain this faction’s ardent anti-US stance. Their final march of resistance addressing the disappearances occurred on January 26, 2006. According to the Mothers’ association, the government is no longer indifferent or antagonistic towards the missing persons from the Dirty War. In June of that year, Argentina held its first trial for forced disappearances since the 2005 annulment of the “full-stop” and “due obedience” laws, which had guaranteed impunity for officers of the military dictatorship. Nevertheless, they continue to march every Thursday in support of other social and human rights causes. The Mothers’ association has established a number of resources upholding the revolutionary ideals of their lost ones. These include an independent university, library, cultural center, and bookstore which subsidize education, healthcare, and other services for students and the greater public. Why are there women here dancing on their own? Arditti, Rita. Searching for Life: The Grandmothers of the Plaza de Mayo and the Disappeared Children of Argentina. First. University of California Press, 1999. 82. Print. "Argentina: 'Disappearance' Trial Breaks Years of Impunity." Human Rights Watch. Human Rights Watch, 19 Jun 2006. Web. 9 Aug 2010. "Argentina: Holding Rights Abusers Accountable." Human Rights Watch. Human Rights Watch, 14 Aug 2003. Web. 9 Aug 2010. "Historia de las Madres." Asociación Madres de Plaza de Mayo. Asociación Madres de Plaza de Mayo, 01 May 2009. Web. 8 Aug 2010. "History of Abuelas de Plaza de Mayo." Abuelas de Plaza de Mayo. Abuelas de Plaza de Mayo, n.d. Web. 9 Aug 2010. 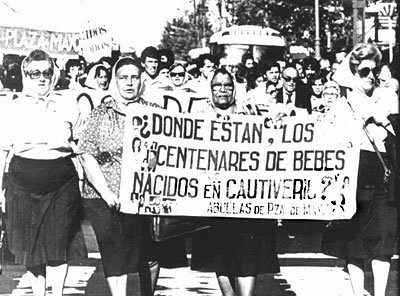 "Madres de Plaza de Mayo." Tourist Guide to Buenos Aires. easybuenosairescity.com, 25 Jan 2010. Web. 8 Aug 2010.